THE STORY - Summoned to a remote Alaskan village to search for the wolves that killed three children, a wolf expert soon finds himself unravelling a harrowing mystery. THE GOOD - The cinematography is stunning, the score is haunting and the mystery is engaging enough to keep you guessing. 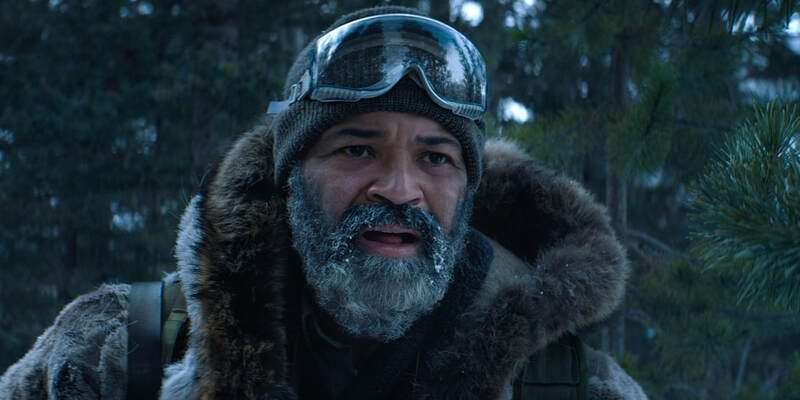 ​Jeremy Saulnier's ice cold, haunting, mystery thriller film "Hold The Dark" is a project that has countless great components but never can fully come together. The mystery of the story is an interesting one and very compelling in the first half of the film. It constantly keeps us guessing but it never truly comes full circle at the end. As per usual in Saulnier's films, the visuals are absolutely stunning. "Hold The Dark" is a film where all of the pieces seem to be much greater than the entire whole. Although the ending doesn't wrap up in the greatest way possible, everything before that is pretty outstanding. While it may not be Saulnier's best project, he still is one of the most exciting up and coming directors working today and anything he makes deserves the world's undivided attention, and he'll have it with its release on Netflix. After the deaths of three children in an Alaskan village, which is assumed to have been done by wolves, a woman named Medora Sloane (Riley Keough) contacts a writer by the name of Russell Core (Jeffrey Wright), a man who spent a year living among wolves and even hunted and killed one himself. Medora asks Russell to hunt down the wolf that she believed killed her son. However, after some disturbing discoveries, Russell learns that a wolf was not the cause of Medora's son's death. Vernon Sloane (Alexander Skarsgard), Medora's husband, returns home to discover that his son is now dead. Hellbent on discovering what exactly happened to his son, Vernon searches the vast snowy plains of Alaska desperate to find the one responsible. While it seems like wolves at first, the local Indian villagers believe that Medora was behind the murder. They don't believe she acted on it herself, however, but rather that she was possessed by an ancient spirit that the villagers believe in. The mystery of what actually happened to the couple's son is definitely compelling and takes a tight grip on your attention for the first two-thirds of the film, but as it slowly drifts further and further into the unknown it slips from compelling into confusing. The mixture of the Indian villager beliefs set against the stone cold backdrop of Alaska, all with a murder mystery woven into the setting is truly marvelous. It makes for another intriguing Saulnier film until the mystery begins solving itself. The characters of the film don't actually solve anything themselves or arrive at any concrete conclusions. Situations that just happen to pertain to the mystery just keep getting dropped in the lap of our main characters. On top of this, the characters themselves are rather hollow. They don't really have any motivation for solving the crime. They all have moments where they are allowed to flourish within the script but in terms of serving the greater picture, the characters are there to take up physical space. While Saulnier's characters are never the most compelling, the ones in this film seem particularly more lackluster than in his other projects. Other than the issue of the characters feeling meaningless at moments and the overall story growing less and less interesting, the film is pretty outstanding. Jeffrey Wright's ability to control his eyes and his face in a way where he is able to keep his emotions and thoughts hidden from the audience is truly remarkable. Riley Keough is excellent in her mysterious and perplexing role as a desperate mother. The performances are great and the dialogue that the actors are given is pretty remarkable. The screenplay is written by frequent Saulnier collaborator, Macon Blair, and the film is adapted from the novel of the same name written by William Giraldi. Aside from the performances, the cinematography is equally outstanding. All of Saulnier's films so far have been visually outstanding and this one is no different. Set against the freezing cold backdrop of Alaska, mixed in with the violence that Saulnier loves to put on display in his films, there are plenty of glorious images within this film. Not only is the cinematography fittingly haunting but so is the score by Brooke and Will Blair. It is a brilliant mix of brass and strings but they also mix in the howls of wolves into specific pieces of music which works so insanely well given the context of the film. The howling of wolves will sneak up on you during certain scenes working as almost a kind of jump scare, giving the film a whole new brilliant layer of depth. "Hold The Dark" is not as good as Saulnier's previous two films ("Blue Ruin" & "Green Room") but it still is rather pleasing. He still is creating worlds that are intriguing and haunting. While he does lose our attention and interest a bit towards the end, his beginning and middle pieces are brilliant. With outstanding performances, stunning cinematography, and a haunting score, "Hold The Dark" is another hit for the Netflix feature film list in the year of 2018. While "Hold The Dark" more than likely won't receive any awards attention and I would say it doesn't necessarily deserve to, it still is an incredibly solid film that deserves to be remembered when people are making their year-end list of great films in 2018.